Thank you, Dean Michael and your staff, who always make this Christmas Eve Mass such a great occasion. As the hymn says of this night of the year, “O Holy Night, the Stars are brightly shining, it is the Night of our dear Saviour’s Birth.” It is a night on which we experience God’s love for us, a love so great that God, in his pursuit of us, becomes one like us, risking all so that we might receive God’s boundless mercy. And God does indeed pursue us. The English poet Francis Thompson reminds us of this in the poem in which he describes God as a “Hound of Heaven” who pursues us “down the nights and down the days.” C S Lewis says that thinking that we are pursuing God is like imagining a mouse chasing a cat. Both make the Advent point: that God will never stop seeking us out and loving us into fuller life. The constant prayer of that great African saint, Augustine of Hippo, was this: “Because you have loved me O Lord, you have made me lovable.” Christmas is the reminder that all of us are lovable because, by coming amongst us, God has made us lovable. In a world in which so many harbour poor self-images, one of the greatest Christmas reassurances lies in the reminder that we are loved by God without reservation. The shepherds of Jesus’s time were despised by the religious and social elites because their calling demanded that they respond all the time to the needs of the sheep, and thus they could not comply with religious rituals. Yet it was to them that the angels made known the wonderful message. We might well conclude from this that God delighted more in their response to the needs of the sheep than in their ritual purity. It might well be that this Christmas too, God will manifest Godself and rejoice more in our responses to the cries of the world, to the pain of the poor and lonely, than in any rituals. Tonight we live in a world and a country in which cries are rising from many quarters. Our Anglican sisters and brothers are among those in South Sudan and Burundi who cry out for peace. Our sisters and brothers, Christian and Muslim alike, in northern Nigeria, the Central African Republic, Mali and Burundi, cry out for peace. The peoples of Syria, Palestine and Israel cry out for peace and justice. We cry out for climate justice – and have been encouraged by the milestone agreement reached in Paris, which gives us hope for a climate-friendly, resilient and more equitable future. In South Africa, after the events of the last few weeks, our cry is that the sacrifices which we and our forebears made for our liberation will not be squandered in the pursuit of false gods and in our worship at the altar of greed and corruption. It is not easy tonight to bring good news of great joy or say, without inhibition, “Happy Christmas”. Many are asking: Where is the joy? How can we put aside our daily cares to celebrate the birth of Christ? Growing, deepening discontent is palpable in South Africa, a discontent that is causing even the most beautiful of days to be invaded by the pervasive smell of the rot which is being spread by the moral pollution of our public life. The #FeesMustFall campaign reflected the dark clouds of restless unhappiness, frustration and rebelliousness against the increasing inequalities that contaminate our daily lives. But whether or not you agree with the government’s response to that, at least it was rational. The sheer recklessness of the firing of Nhlanhla Nene, the failure to consider the needs of the nation, and particularly the needs of the poor, was staggering. Since then, we have seen the shocking revelations by City Press of how corrupt leaders and members of a teachers’ union have captured large parts of our educational system for personal gain rather than our children’s welfare. Frighteningly, our nation’s moral pollution has infected sections of our government in epidemic proportions. If not purposefully and vigorously addressed, this pollution will disorient us, engulf us and eventually overwhelm us, and will deny us the possibility of achieving our unique potential as a nation. It sometimes feels as if some of our leaders stopped their fight for a new South Africa at the point at which they joined the ranks of those who corruptly and immorally amassed wealth under colonialism and apartheid. Our struggle now should not be for the new, multiracial middle class to live as the white elite lived under apartheid: it should be for a new society, a more equal society, a society of equality of opportunity in which the wealth that comes from new economic growth is shared equitably among all. And let us not make the mistake of thinking that the solution to our problems lies simply in replacing one leader with another. The new struggle is about values and institutions rather than about personalities, which is why, when church leaders went last week to see President Zuma, we said we agreed to work with the Presidency to restore trust in government. Working with the Presidency means working with the institution, no matter who the incumbent happens to be. We know that the abuse of our institutions for political reasons did not begin with President Zuma’s incumbency, so whether or not he is replaced before his term ends, we need to build strong systems and institutions which cannot be undermined by one party or person’s whim. Some of our readings for this season allude to frightening signs and apocalyptic visions - signs and visions which have seduced many followers down the centuries into strange doctrines, unusual expectations and relentless fear. Yet a close reading of the scriptures reveal a comforting truth, that no matter what the circumstances, no matter how dismal the outlook or how bleak the diagnosis, we are heirs to the unshakeable promise that God is always with us. In the midst of our trials and tribulations, God is waiting to be born, or waiting to be discovered again no matter where we are in our lives. So as we face 2016 with all its uncertainties, with its governance challenges, and with its threats to our well-being as a nation, we must hold onto the belief that we can overcome them. And then let us act on that belief: join together, organise, lobby and embark on what I call the New Struggle, the struggle to ensure that the sacrifices that so many made for our liberation are not wasted, the struggle against greed, corruption and nepotism, the struggle for true justice, including economic justice, and the peace from God that flows from justice. That New Struggle began in 2015, when we saw a national mobilisation of young and old alike against the failures of leaders who are allowing the corruption epidemic to rob the people of South Africa of the fruits of their hard-won freedom, gained over many decades by the old struggle against apartheid. We must use our words and our actions against those who put their own personal interests ahead of those of the people, promoting a culture of “Me” instead of a culture of “We”. We must oppose those who take and don’t give, those who use hateful racist and xenophobic language, those who ignore the needs of our students, our neighbours and communities. Against all of this, we must rise up. If we learned anything from the courage of our students who said “enough is enough”, it is that we are able to create a society rooted in human love and in God’s care for us and all people everywhere. In that spirit, let us light candles of hope across the country -- mindful that there are those who cannot afford even a candle. This Christmas, let us recognise that if we are to be signs of the new dawning Kingdom, it will involve a journey away from all that blinds us to the suffering and misery of others, from inherited forms of privilege and wealth, and from a world view that is comfortable with excluding from the resources of the world the other who is different to us. It will involve, instead, a commitment to works of justice and peace, to building relationships that are gentle and nurturing, and to doing that which the Angels did, bringing good news of great joy for all people. Do Churches Still Hold Moral Authority in Today's Society? Ashraf Garda of SAfm in Johannesburg talks to Archbishop Thabo Makgoba and Bishop Malusi Mpumlwana, General Secretary of the South African Council of Churches. The Archbishop completes his Advent reflections. The reading for the Fourth Sunday in Advent is Luke 1: 39-55. Archbishop Thabo's reflection on the Third Sunday in Advent: Reading from Luke 3: 1-6. Click on the recording below, or you can download the file to your mobile device and share with your friends. The full recording of Evensong at St George's Cathedral, Cape Town, on December 6, the Second Sunday in Advent and the day after the second anniversary of the death of Nelson Mandela. We meet today as people of faith, joining with brothers and sisters around the world, to pause and remember Madiba on the second anniversary of his death. It is fitting that we should do this at the Cathedral because it is here that we, people of faith and of none, have over the past half century proclaimed a message of justice -- from this pulpit, from the platform below and from the steps outside. Archbishop Thabo's reflection on the Second Sunday in Advent. Click on the recording below, or you can download the file to your mobile device, listen later and share with your friends. The Gospel reading is Luke 3: 1-6. Fasting at an empty table. My last day at COP21. 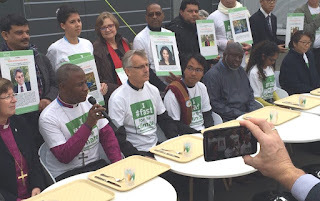 As one of those who have been fasting for climate change - and in solidarity with those who don't have food - on the first day of every month, I today joined a group who have been doing this fast for two years. To drive the point home, at lunchtime we set a table with a "menu" in a passageway at the talks, and took turns to sit there, 10 of us at a time in 10-minute shifts to comply with a police regulation prohibiting gatherings of more than that. Our plates were empty and our cutlery unused as we shared why we were fasting, drawing from the wealth and plenty of our spiritual wells.